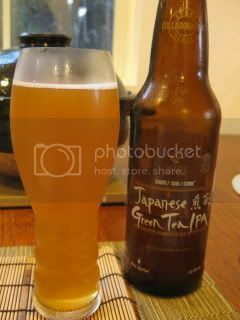 HAPPY DONABE LIFE - Mrs. Donabe's Rustic Japanese Kitchen: Japanese Green Tea IPA...very nice brew! All proceeds from the sales of this beer will go to Japan Earthquake and Tsunami Relief by Red Cross. This beer is 9.2% alcohol. The color is beautiful orange/ honey. The aroma is citrus/ spice, and the flavor had a hint of sweet bitterness, which reminded me of Sencha green tea. I loved it so much! I ordered last 4 bottles from K&L Wines (since their Hollywood location didn''t carry it, the order was shipped from their Redwood City location up north). Now, I can't find it anywhere...I wonder if Stone Brewing will make extra production of this special collaboration beer. I hope!